Some time back, I came across this falling apart and unattractive brooch at a yard sale. I think what sold me was the tacky mardi gras colored beads (not sure what they are made of ... don't feel either plastic, metal or glass) .. it's so New Orleans ... crippled but with possibilities. It's been sitting in the 'jewelry finds' drawer for at least a year. -- Removed the tarnished jump rings and beads from the brooch hardware. -- Removed the headpins from the beads and put them away for some future use (thinking Mardi Gras earrings for me ... but I'd better get on with it as season is starting today). -- Took the brooch hardware out to the kitchen and cleaned it with some tarnix and polished to return the luster. 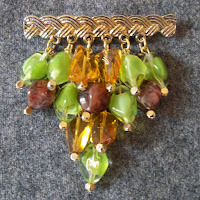 -- Selected new beads in green, amber & brown. 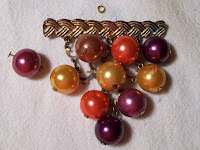 -- Attached to brooch with new jump rings.